The books I seem to be getting through the quickest these days are the ones which I'm reading aloud to the kids. This is not something I mind, because I tend to read them books which I like as well! We recently finished reading The Phoenix and the Carpet which is the sequel to The Five Children and It (linked to my review of 2013). It took us awhile to get to book two in the series but it was well worth the wait. We thoroughly enjoyed it. In The Phoenix and the Carpet we find ourselves again spending time with Robert, Anthea, Cyril, Jane, and their baby brother, "Lamb." This time their parents have purchased a new carpet for the nursery which, once rolled out, reveals an egg. They try to return the egg to the shop owner, believing it to be his, but are unsuccessful at doing so. The children's father grants permission for them to keep the egg which begins the adventure. The egg ends up being knocked into the fire and, as a result, a phoenix is born. Not only are the children amazed by a golden bird in their midst, but they are also quite happy to discover that this newly purchased carpet has certain magical properties; it can take them anywhere they wish to go and fulfill wishes. In The Phoenix and the Carpet we travel along with the four children as they ask the carpet to take them hither, thither and yon. Each chapter contains a separate adventure which usually begins to fall apart in some form or fashion, always leaving the children grateful for their "normal" and "boring" life without magic. It would seem that adventures just aren't always what they are cracked up to be. Near the end of the story, after having several misadventures with both the carpet and the bird, the children realize that its time to say goodbye to both. They are full of memories of good times and bad but for the sake of the family they need to send the Phoenix away and get rid of the carpet. All's well that end's well by the time the book comes to a close. The children are sad about the conclusion of their adventures, but happy about the lessons learned and memories made. My kids have thoroughly enjoyed each Nesbit title that we have read. Immediately upon closing the pages of this one they asked if there was another title involving these same children. What great joy to be told that there is a third title in this series, The Story of the Amulet ! Perhaps we should scoot along to it before two years passes this time, hmm? 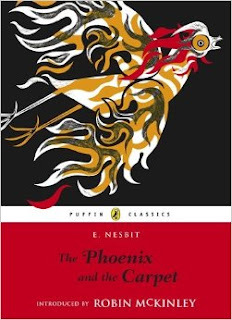 Nesbit is such a great author. Her stories are decently complex, full of imagination and magic, and are just plain good fun. She also sprinkles a great deal of wit throughout the story which makes reading the book fun for both adults and kids. C.S. Lewis read her voraciously and it is rather safe to assume that her writings influenced his own. This might be in part why I'm drawn to Nesbit's stories just like I'm drawn to Lewis's. It might also be why my own children enjoy her tales. There is a similar delight between Nesbit and Lewis. I believe it safe to say that if you enjoy the one, you're more than likely to enjoy the other. If you haven't yet read E. Nesbit, make a point to! We very much enjoy and highly recommend them to you! That was my favorite as well. Seconded by the Phoenix crowing unexpectedly in the theater. I had no idea there was a sequel to The 5 Children and It! We loved that one and one of her other books, The Railway Children, is still one of my favorite read-alouds ever. She was one of my favorite authors as a child. The Railway Children is a must.